A strong defensive rebounding team meets a strong offensive rebounding team Friday when the Michigan State Spartans and LSU Tigers collide in the Sweet 16 of the 2019 NCAA Tournament. The Spartans (30-6) pull down 30.1 defensive rebounds per game, the third most in the country, and in their 70-50 second round victory against Minnesota, they grabbed 34 of them. Meanwhile LSU (28-6) averages 13.4 offensive rebounds per game, which leads the SEC and ranks 10th in the nation. Tipoff is scheduled for 7:09 p.m. ET from the Capital One Arena in Washington, D.C. The Spartans are favored by six in the latest Michigan State vs. LSU odds, while the over-under for total points scored is 149, down 1.5 from the opener. Before making any Michigan State vs. LSU picks of your own, consult the 2019 NCAA Tournament predictions from the SportsLine Projection Model. Now the model has honed in on Michigan State vs. LSU. We can tell you it is leaning over, and it has also generated an against-the-spread pick that cashes in nearly 60 percent of simulations. That one is only available at SportsLine. The model has considered that the Spartans have won 12 of 13 games since going through a midseason slump in which they lost three straight. The hot streak includes five wins over ranked teams (three against Michigan and two against Wisconsin). The biggest reason for Michigan State's late-season run is the play of junior point guard Cassius Winston. The Big Ten Player of the Year, Winston is the only player in the country averaging 18.0 points, 7.0 assists and shooting at least 40.0 percent on 3-pointers. He has accounted for 24.1 percent of the team's points this season (680 of 2,826). Michigan State has covered 13 of 20 games away from home this season and is an impressive 23-9 against the spread as a favorite. But just because the Spartans excel on both ends of the floor does not guarantee they will cover the Michigan State vs. LSU spread in the 2019 Sweet 16 on Friday. The Tigers feature a balanced offense with a strong back court and a physical front court that gets to the free throw line. LSU averages 80.9 points per game, the second most among SEC teams. Of those points, 17.5 (21.6 percent) come from the free throw line. Sophomore point guard Tremont Waters triggers the Tigers' offense. He leads the team in scoring at 15.0 points per game and paced the SEC in assists per game with 5.9. And he seems to thrive when the game is on the line. 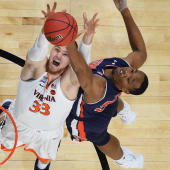 Against Florida on March 6, he drove the length of the floor as the clock was winding down and made the tying bucket to send the game into overtime. And in LSU's second round game against Maryland, Waters made the winning layup with 1.6 seconds remaining. So who wins LSU vs. Michigan State? And which side of the spread can you bank on in nearly 60 percent of simulations? Visit SportsLine now to see which side of the LSU vs. Michigan State spread to jump on, all from the advanced model that's up more than $4,000 on top-rated college basketball picks the past two seasons.